With dark clouds, heavy rain and dangerous lightning approaching, the organizers of the Pro Football Camp held at Nicholls State University had to make some in-game adjustments to keep things rolling on Friday. After completing the morning session in perfect weather, thunderstorms moved into the Thibodaux area during lunch at noon and kept camp coaches and players off the football field for more than an hour. 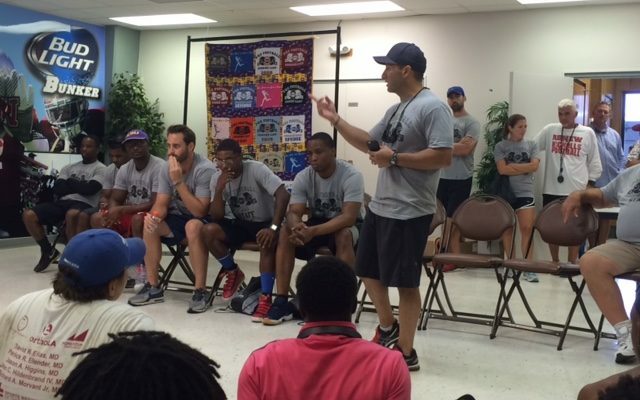 But camp organizers took advantage of the free time by assembling nearly 200 athletes from 35 high schools across the state in the Century Room of John L. Guidry Stadium for a question-and-answer session with former professional football players and current college and high school coaches. The camp also held its awards program during the weather delay. Once the bad weather moved through the area, the camp coaches and players headed back out to the field where they ended the day’s events with an afternoon session that consisted of various football drills by position and a little 7-on-7 action. Dr. David Elias of OrthoLA said it was the perfect way to close out the ninth year of the Pro Football Camp, which was sponsored by OrthoLA, Momentum Thibodaux Crossfit and the Sports Medicine Center at Thibodaux Regional. The camp, which was for players in grades 8-12, was attended by several former NFL players, including ex-LSU athletes such as Richard Dickson, Skyler Green, Randall Gay, Mark Roman and Trev Faulk and former South Terrebonne/Louisiana Tech star Phillip Livas. Former Thibodaux High standout Trovon Reed, who is now playing defensive back for the Seattle Seahawks, and former LSU All-American and Canadian Football League Hall of Fame defensive tackle Ronnie “Crockett” Estay also attended. Current college football players in Louisiana-Lafayette star running back Elijah McGuire, a former Vandebilt Catholic product, and Arkansas-Monticello receiver Trevon Smith, a former South Terrebonne standout, also contributed. Nicholls head coach Tim Rebowe and his coaching staff and players also ran many of the drills at the camp. Dr. Elias, who is the brother of camp creator Albert Elias, a local sports agent who died in his sleep due to cardiopulmonary causes at age 42 in 2012, said the camp was blessed to have another strong staff this year. H.L. Bourgeois football coach Carey Melvin said the camp was a great way for players to learn skills and get exposure. Ellender junior lineman Sedrick Williams said it was his second straight year attending the camp. It was the first time Thibodaux High receiver Rochon Washington attended the camp. The camp, which will award several college scholarships to selected senior athletes who attended next year, also attracted players from out of state. Defensive tackle Dashawn Crawford, who has an offer from Nicholls and interest from Ole Miss, Southern Miss, Louisiana Tech and Mississippi State, traveled all the way from Bay Springs, Miss., to attend the camp and visit the campus. Elias said he wanted to thank all sponsors and contributors to the camp, including the staff at Thibodaux Regional and the office staff at OrthoLA.